With the European economic and monetary union and the introduction of the Euro, a further step in the globalisation of the markets was made. This means more and more growing stress of competition for nearly every company, because trade and entrance barriers have been elimi- nated. On the other side, this also offers more chances for growth and extending the business. Both aspects of course have one in common: capital requirements and especially staying liquid. In critical economic situations it is more than ever important to stay liquid (having enough pos- sibilities to cover the short-term possibilities). That’s the task of financing and planning the finances. There are two main sources of assessing capital: equity financing and outside or credit capital. It should be a strategic and well calculated decision, what the capital structure of a company should look like. The “leverage effect” plays an important role in this context. But it is often not easy to create this structure like it is wished. There are many factors which influence the “price” and the efforts for getting liquidity out of certain capital sources. One big example therefore is the “Basle 2” decision, which makes it more exertive for companies to gain loans of banks. This can also mean worse conditions of the loans. These circumstances make it inescapable to seek better alternatives - like for example getting equity. Not only because of tougher times for gaining credit capital, but also because of the continuous intensification of competition, has equity financing become more and more important. One cause for that is the long-term oriented affiliation of equity capital to the firm. There are normally no “stressing” dates when it has to be paid back like is the case with loans from a bank. 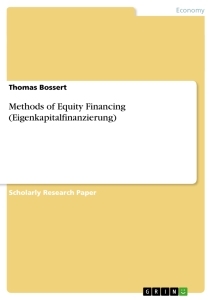 This elaboration will give a brief overview about the topic of equity financing. The most important and common possibilities will be presented and evaluated. But we will also have a look at some special forms and more or less unknown facts about this topic. As mentioned, this elaboration focuses on the equity capital sources, because of its growing importance in times of globalisation, “Basle 2” and tougher competition. Equity capital is long-term oriented capital. This means it has no certain duration or pay-back date like credit capital. Another difference in the comparison to credit capital is, that equity usually is conterminous with special rights and power over the company for the equity capital provider. These can be rights to vote or special options for equity owners like for example share-holders have it in form of the general assembly. This long-term orientation of equity capital automatically means a certain security for the com- pany and for the creditors. The relationship between the amounts of equity capital and credit capital is always a relevant factor for the substantial situation of a company. The more equity capital is held (relatively) the securer the situation can be seen. In turn, this can be an impulse for potential investors or credit grantors. Many banks use the equity-ratio (“Equity / Total Capital”) as criterion for the credit rating. A recommendation of the State Ministry of Economic Affairs and Employment in Germany says that equity should minimally represent 20 percent of the total capital. The idea of an investor, who offers equity, is normally making profits with it. The profit which is made with equity, or better said the profit of a company, can be used in two ways. Either the added value rests in the company (“retention of earnings”), because the firm’s aims are growth for example, or the profits are distributed among the shareholders / investors (“distribution of earnings”). Usually a mixture of both is done. This assignment concentrates on the feed of equity in monetary form. These numerated points are described and regarded in detail within the following chapters. Chapter three will give a first overview about the coherence of a company’s legal form and its possibility or chances for using certain equity financing channels. The possibilities of getting equity depend essentially on the legal form of the particular company. A distinction is drawn between issuable companies and non-issuable companies. It is not possible to answer the question about the optimal legal form, because the individual premises of each founder are different. But if one embraces the possibility of the integration of potential investors, the legal form of a public company would be the most advantageous. Especially for business partnerships it is often a problem to get equity capital.9 The advantages and disadvantages of the different methods of getting equity in context with the legal form will be discussed in the following chapters of this assignment. Within the scope of external financing, the source of the equity is outside the company. Private Corporations, business partnerships, limited liability companies, but also smaller stock corporations have no access to the stock exchange. For these companies there exists no highly organized capital markets at which they can get equity. That is a significant difference to marketable stock corporations. Individual enterprises face the biggest problems in getting equity, because at the beginning they only have the capital of the founder. The owner can increase the equity by bringing his capital into the company, but he can also decrease it by taking it away from the company. The second chance for individual enterprises would be getting equity through self-financing, which is discussed in one of the following chapters. If new partners (except silent partners) join the company, the legal form changes into an ordi- nary partnership. A further possibility to get equity would be the change into a limited partner- ship. In this case, there is one general partner who is unlimited liable and some limited partners who are maximum liable up to the amount of their capital brought in. Because of the limited liability of the limited partners, it is often easier for the company to get equity, because the risk for the investors is not so high. At a limited liable corporation, the liability of all participators is limited to the amount of their capital brought in. That is the reason why it is relatively easy for a limited liable corporation to get equity. The partner’s interest shares are tradable, although they are not very fungible. There exists no organized market place to trade with them. One important formal step which has to be considered for going public, is the legal form of a company. In Germany it is only possible for specific capital companies: that is the “Incorporated” and the association limited by shares. In Germany many potential stock market candidates predominately are business partnerships or limited liability companies. This means inevitably a change of corporate form, for which a time of six to twelve months can be calculated. New corporate organs have to be elected and an entry to the commercial register has to take place. This can happen after a positive audit by a certified accountant.